perfect. Thanks to Monroe for booking this beautiful oasis of a paradise. This trip I did no research at all which was great since I'm usually the one doing all the research when I travel with my friends. Monroe did such an amazing job at booking the perfect spot. Located in the heart of the Medina, a 10 minutes walks to everything such as Ben Youssef Madrasa and Nomad,the square. The minute we walked in, we felt like we were in the pages of a design magazine. The colors, the pool, the furniture,the plants,music the art- every single thing was amazing. The staff immediately made us feel like we were at home and gave us so many helpful tips to navigate the souks.We were greeted with some delicious mint tea and biscuits. Whenever we had a question or needed something, they were there within minutes. They prepared us the most delicious breakfast spread each morning. Our room in the Riad is decorated in authentic Moroccan artwork,colors,tiles, comfortable and quiet. I never wanted to own a house before until now. 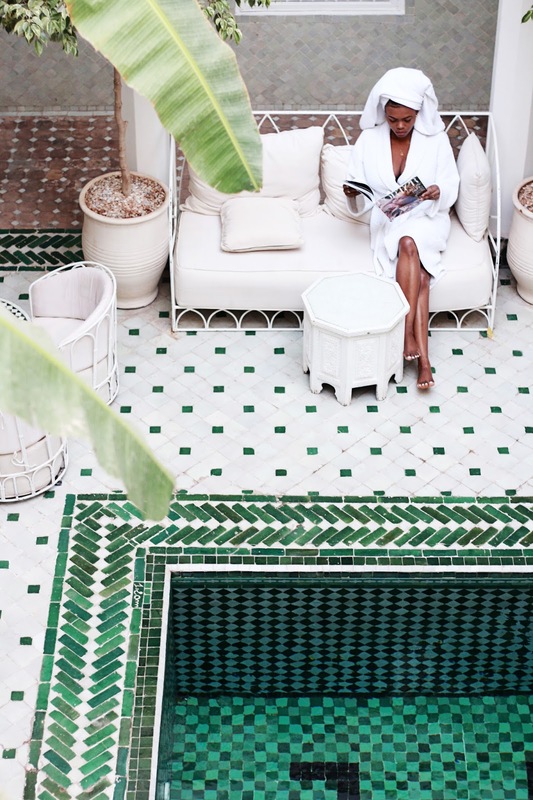 I want to be able to have Moroccan tiles,and everything in my place.The rooftop terrace dotted with comfortable loungers is a great place to relax and where we had our breakfast. 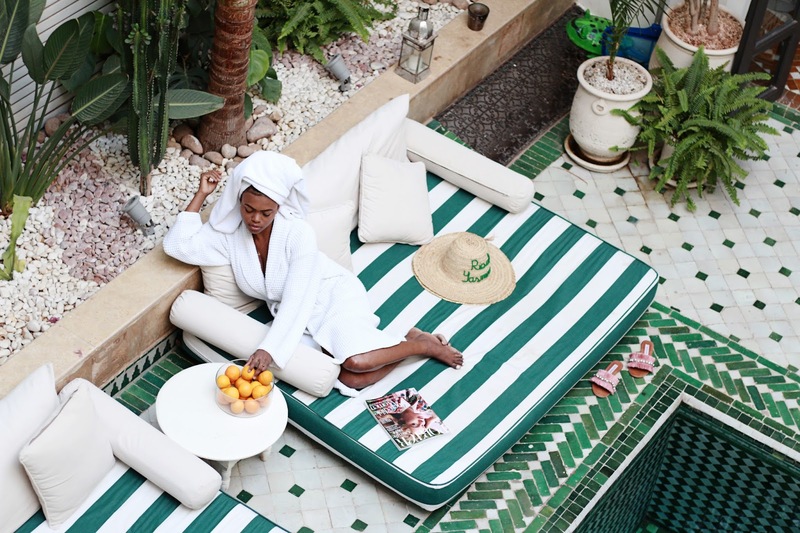 The pool is perfect to cool off on those hot Moroccan days. 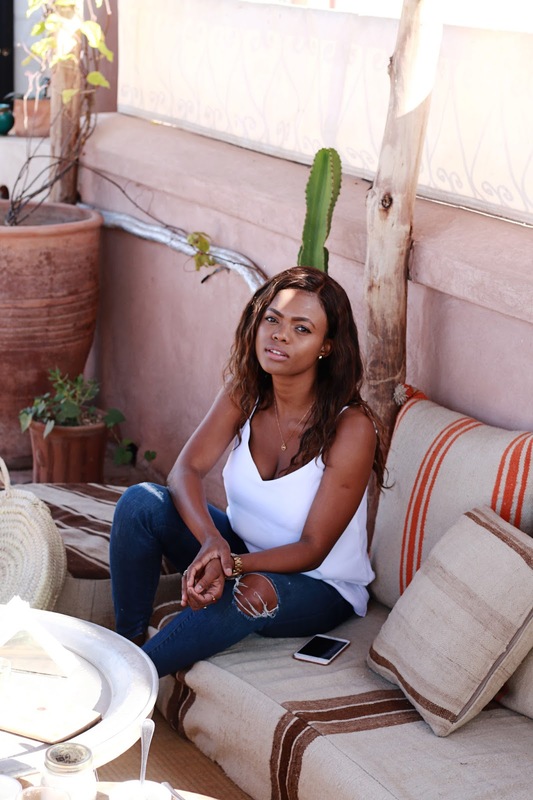 I can only say great things about our time at Riad Yasmine. Tips: have your hotel set you up with a pick up from the hotel to avoid being ripped up. Skip the hotel dinner option(not breakfast), just walk around the souk and find amazing meal for less than $20 US. I highly recommend Dar Mama which is a 7minutes walk from Le Riad Yesmine. Have the Hotel set you with taxis for the day also to avoid getting ripped up unless you got my bargaining skills, then go right ahead. Skip Buying wicket bag from the hotels, much cheaper at the souk.